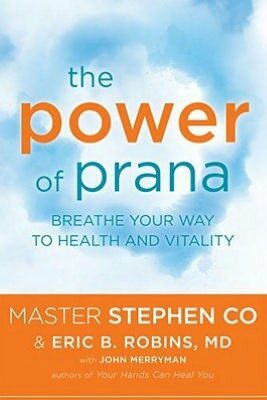 The Power of Prana by Master Stephen Co, teaches us how prana, or our energy, can be revitalized by the use of simple and effective breathing techniques. Packed with easy to understand exercises, illustrations and instructions, the practitioner can begin right away or may read through the book first and then proceed, depending on their expertise. The first chapter explains why we often suffer from low energy and fatigue. Here Master Co lists a number of causes and conditions ranging from environmental situations, poor sleep, diet, to lack of exercise. The end of the chapter gives guidelines on how to use the book so the reader can get the most out of each chapter. Chapter Two discusses the chakra system and the anatomy of pranic energy, which in and of itself makes for fascinating reading. It discusses the four keys of breath modification as well energetic hygiene and goes into depth on the chakra system. It also introduces us to the 9 energetic breaths, which is the main topic of the book. Chapter Three introduces the reader to pranic breathing and gives easy to follow guidelines on how to learn how to do it safely and effectively. There are also meditation guidelines and exercises to do to build up ones energy. Chapter Four discusses energetic hygiene and the importance of performing these exercises in order to maintain good health. The author recommends a diet that is as close to our primary sources of energy as possible—purchasing locally grown produce and grass-fed beef, etc.—instead of relying on foreign and refined food substances. Master Co recommends cutting energetic cords to memories, people, places and things. He provides instructions on how to do that as well as explains the use of cleansing swims salt water baths as well as the importance of getting enough rest. Chapter Five is an introductory guide on cleansing exercises which are fun and easy to perform. Six is an introduction to the 9 energizing breaths. Here, Master Co provides us with a brief history of his techniques, discusses what they are and describes the effects these breathing exercises have on the body. He instructs the reader in how to perform the 9 energizing breaths by using concise and easy to understand instructions as well as an illustrated guide to the main practice. Chapter Seven is a guide on basic meditation practices and techniques. Chapters Eight provides extra exercises and short rituals used to enhance the reader’s experience. Chapter Nine and chapter nine is a daily practice guide that is useful in creating a daily purification routine. The Power of Prana is an excellent guide for beginners who wish to bolster their vitality through pranic breathing practices, yet it isn’t simply a primer. More advanced practitioners will find this a good review or may pick up new techniques that will enhance their practice. Those already advanced in meditation may find the basic practices not as effective as what their masters have taught them, but they are merely a guide for beginners. More advanced practitioners may either substitute their own meditation practice or skip the chapter entirely. Authors: Stephen Co and Eric B. Robins, Md.